In the early 1900s doctors advised Americans to steer clear of spicy foods. A plain diet with lots of meat and dairy was thought to improve digestion. At the same time food as a science was beginning to come front and center – for instance Fanny Farmer opening her “School of Cookery” in 1902, promoting a scientific approach to food preparation. In addition to her school and others, immigrant focused schools and training centers known as Settlement Houses, aimed to teach new immigrants “proper” cooking and health. 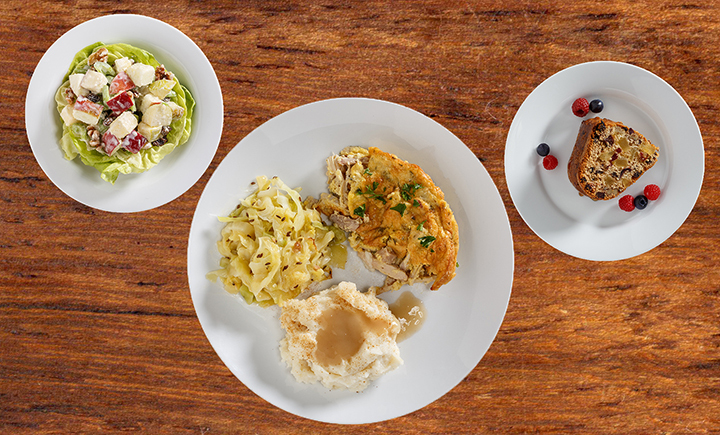 It even includes its own recipes for some of the foods on our 1900s plate like Waldorf salad, mashed potatoes, and fruit cake. 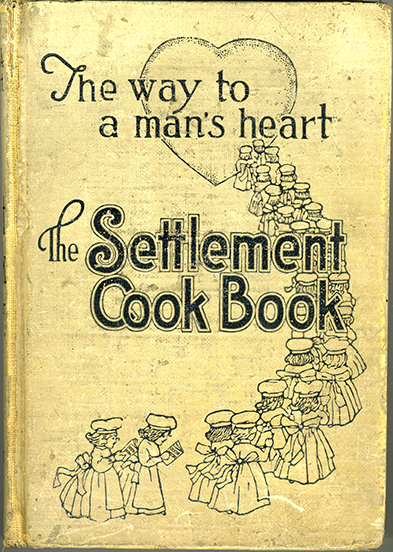 Read more about The Settlement Cookbook here! 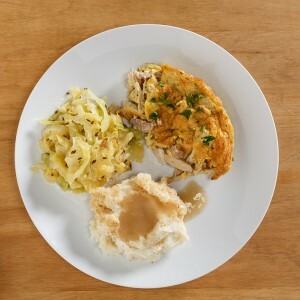 Chicken pudding was a dish that survived nearly a century as one of America’s favorites! 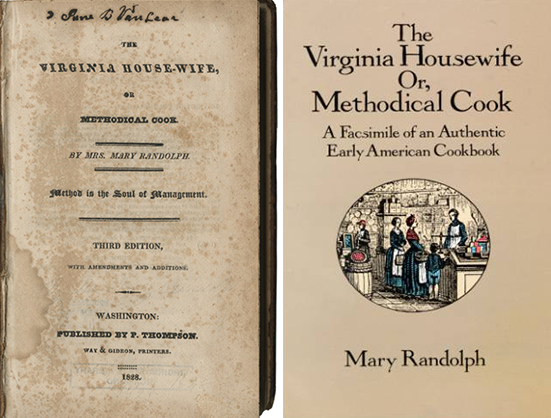 A casserole-like dish high in protein and dairy, it appears in the 1827 cookbook “The Virginia Housewife” by Mary Randolph. 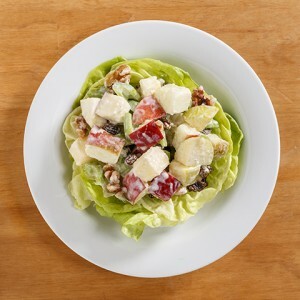 The Waldorf salad has a distinct point of origin – the Waldorf Astoria Hotel in New York, but its history highlights the mutability of even the most favorite of recipes. It’s widely known that Oscar Tschirky—the storied, original maître d’hôtel of the Waldorf Astoria Hotel—was the creator of the notorious salad. 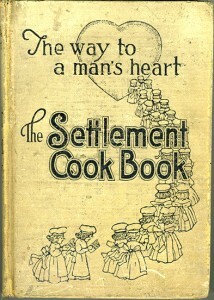 The original recipe can be found in his cookbook, The Cookbook by Oscar of the Waldorf, with only three things: apples, celery, and mayonnaise (no walnuts to be found). The most intriguing part of the history of the dish that he’s most known for—and a testament to the recording of recipes—is how many iterations it’s been through in its lifetime. In each cookbook Matt and I looked through, not one recipe for the salad had the same ingredients. The Story Behind The Most Popular Salad in New York via Food52. Read the rest of the article. For something with such a dire reputation the fruitcake has staying power and a geographic dominance rarely seen outside branded snack foods. 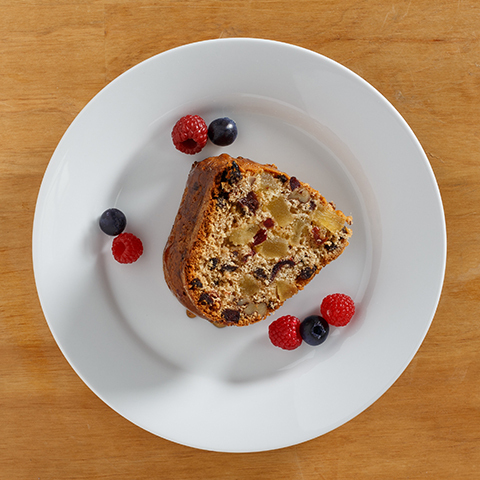 The earliest fruitcake recipe, dating from ancient Rome and called “satura,” includes pomegranate seeds, pine nuts, and raisins mixed into barley mash. Honey, spices, and preserved fruits were added during the Middle Ages. The Village Voice cites the rise of cheap sugar from the Americas as the harbinger of the fruitcake’s rise in popularity starting in the late 1600s. The New York Times argues that our twisted view of fruitcake stems from a lack of experience with the homemade variety versus the commercial. Smithsonian Magazine has a great “concise cultural history” of the fruitcake you should definitely check out, read it here. 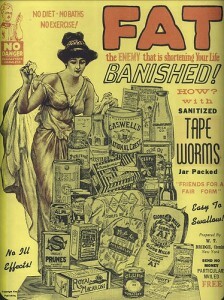 Terrifying Diet Fads of the 1900s! This one makes a re-appearance in the 1950s! The Birth of the Brownie! Return to What’s On Your Plate master post.